Grain alcohol and blackberries, no rainwater required. 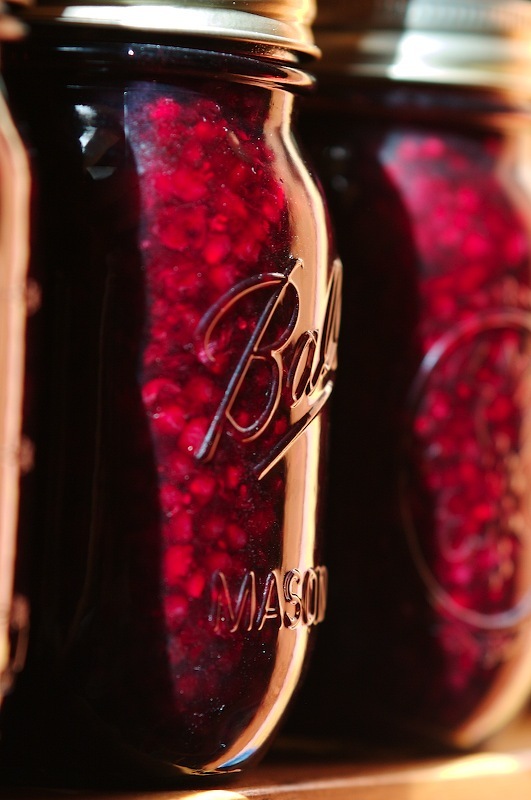 Following this rough guide, we started the blackberry liqueur in 4 pint mason jars, then added 4 more the next day once we had the quantities aorted out. Each one was loosely packed with berries. A 750ML bottle of strong spirits was enough to cover 4 berry jars. This should work out to roughly 3/8 vodka and 5/8 berries. This batch is using 105 proof grain spirits, so I’m expecting that the raw proof number should be in the realm of 35 or so. That of course will vary by how much gets lost in the much that will get strained out, evaporated, or otherwise messed with. In a month or so, I should do the straining process, then temper with sugar (simple syrup with a touch of honey) and let it mellow till about new years or so. At some point, I’ll need to bottle this into something that’s a little more airtight than the mason jars, but I’m not sure of that timing. I’ll have to see if I can find some 1/2 or 1/4 sized wine bottles and appropriate corks by then.